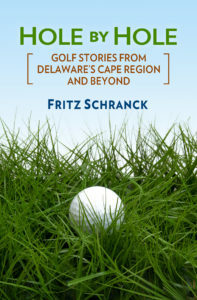 Hole By Hole is the website for my golf book reviews and golf columns. The site originally began in 1997 as the online presence for my handicap stroke allocation service. I used the actual scores posted by golfers, as well as the allocation guidance in the Handicap Manual of the United States Golf Association. I performed this service for golf courses throughout the United States. In 1998, I joined Amazon.com’s Associates program, and began posting golf book reviews at Hole By Hole. In November 1998, I chatted with Trish Vernon, the editor of The Cape Gazette, the major newspaper in southern Delaware. The twice-weekly paper focuses on the Atlantic Coast communities of Rehoboth Beach, Lewes, Dewey Beach, Milton, and the surrounding area. Vernon asked if I would be interested in writing a golf column for the newspaper. My first column ran on January 1, 1999. It’s been a weekly Friday fixture in the Gazette ever since. The writing part of Hole By Hole became it’s primary focus, so I have ended the allocation service. I am also a member of the Golf Writers Association of America. About the banner photo: The par-3 third hole on the Black Bear Course at Bear Trap Dunes, Ocean View, Delaware.